Brian Jackson from WJXT interviewed Alex Trujillo, FlightScope USA Sales and Support Manager, on the exclusive integration between FlightScope and FocusBand. FocusBand allows golfers to compare their mental state from setup through impact side-by-side with FlightScope data. Using real time audio-visual neurofeedback, it uses three woven sensors to measure brain-wave frequencies as they perform various tasks. 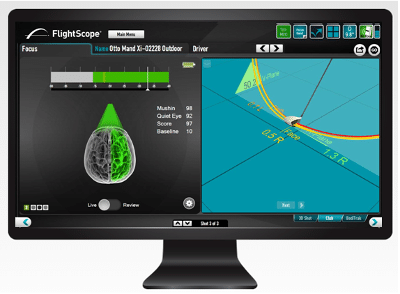 This allows golfers to validate their mental state quantitatively with FlightScope's ball and club data, building confidence and reinforcing pre-shot routines. The FlightScope and FocusBand combination is ideal for golfers who want to become experts in training their mind to enter a calmer state before and during every shot. This level of enhanced training is essential for anyone who wants to take their game to the next level.